If you are looking for a peaceful getaway, look no further. Secrets Aura Cozumel is the perfect resort to celebrate a destination wedding, honeymoon, or wedding anniversary. With top quality accommodations and service, this resort guarantees a relaxing vacation for all of its guests. In a perfect blend of luxury and excitement, Secrets Aura Cozumel is the ultimate adults-only, all-suite resort located on the island of Cozumel. Sitting just 12 miles off the coast of Mexico’s Yucatan Peninsula, Distance from hotel to Cozumel International Airport (CZM), 10.5 miles (17 kms). Distance from hotel to town, 9 miles (15 kms). At Secrets Aura, you can bask in a world of Unlimited-Luxury while staying in one of 266 contemporary, stylish suites complete with private terraces or swim-up access, stunning views, 24-hour room service, daily refreshed mini-bar and more. In addition, you can add more luxury to your getaway by upgrading to the Preferred Club and enjoy additional amenities and inclusions. The experience continues with limitless gourmet dining at gourmet restaurants and top-shelf spirits at three bars and lounges throughout the resort. Light up the night with live nightly entertainment and activities. Or enjoy land and water sports, three sparkling pools, live entertainment with pool and beach wait service throughout the day. Dive into the Caribbean at nearby world- renowned dive sites; explore the natural wonders of the second largest coral reef system in the world, the Mesoamerican Barrier Reef System. Learn to scuba dive with the help of the full-service, on-site dive operator, Dive house. You can also indulge yourself with specialty treatments at the Secrets Spa by Pevonia, the most complete spa on the island, or simply spend time with the one you love. $ – Fees may apply. Barefoot Grill: Enjoy a variety of light lunch specialties with an ocean view each day. Open for lunch. Seating capacity: 60. Dress code is casual attire. Bordeaux Restaurant: Savor the taste of French cuisine each evening at Bordeaux, serving delectable fare in a romantic, elegant setting. Open for dinner. Seating capacity: 90. Dress code is casual elegance attire. Coco Café: Savor the taste of French cuisine each evening at Bordeaux, serving delectable fare in a romantic, elegant setting. Open for dinner. Seating capacity: 90. Dress code is casual elegance attire. Desires: Music lounge bar. Hours – 10 pm to 2 am. Cava: Wine Cellar for private dining. Gohan Restaurant: Sushi bar. Open for dinner. Dress code is casual attire. Manatee’s Bar: Swim up bar serving tropical drinks. Hours – 10 am to 5 pm. Market Café: A grand buffet offering local and international dishes. Open for breakfast and dinner. Dress code is casual attire. Oceana Restaurant: Scrumptious seafood favorites served a la carte in an outdoor setting, perfect for a romantic evening with your loved one. Open for lunch and dinner. Seating capacity: 60. Dress code is casual attire. Rendezvous: Lobby Bar. It offers great views of the Caribbean and boasts intimate seating, friendly staff and a full bar with premium liquors and signature cocktails such as a Don Julio Martini or an Island Mojito. Hours – 12 pm to 11 pm. Preferred Club Lounge: Just one of the wonderful amenities offered to their Preferred Club members. Preferred Club Swim Up Bar: For preferred guests only. Open from 10 am to 5 pm. Sky Bar: Rooftop bar and sushi bar. The cool Cozumel breeze is just what you’ll feel relaxing at the bar. Its high atop buildings and boasts two Jacuzzis for soaking and sipping. Hours – 6 pm to 10 pm. Swim-Up Bar: Preferred Club pool bar. Hours – 11 am to 5 pm. 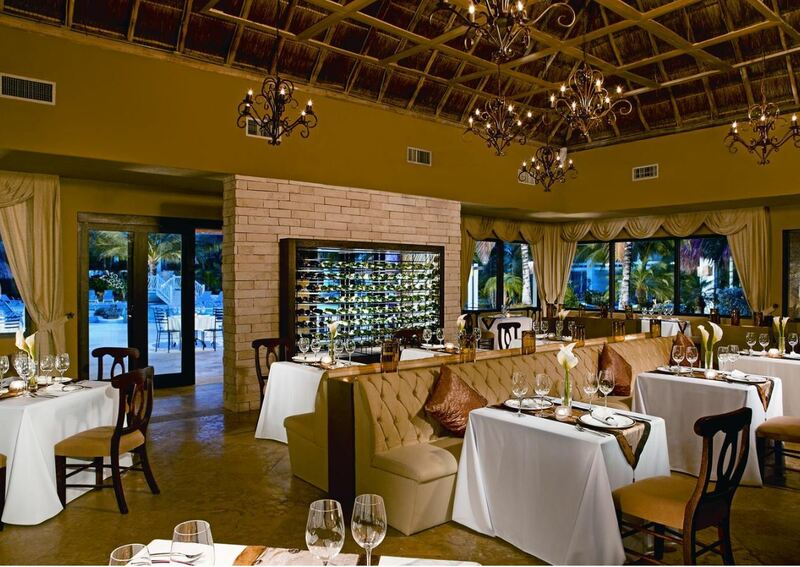 Windows Restaurant: Local and International cuisine. Delicious national and international cuisine served up a la carte. Open for breakfast, lunch and dinner. Dress code is casual attire. Seating capacity: 90. Secrets Aura Cozumel offers three romantic wedding packages. With abundant options to personalize, find the perfect wedding package then make it your own. Or, get married underwater! 15% discount on all spa treatments (boutique purchases not included). * This package is complimentary when booking at least 7 nights in the required room category or if 5 rooms, any category, are booked for at least 3 nights. This package also applies for renewal of vows ceremony. *Symbolic Ceremony will be included, services of a minister or judge will incur an additional fee. These fees vary by resort and will be confirmed by the wedding coordinator. The complimentary wedding package may not be available during all dates and times at the discretion of the resort. *2017/2018 – In the months of August, September, and October 2017/2018 the package price will be $2,799 USD. All remaining months of 2017/2018 will be the standard package pricing of $3,199 USD. *Please Note: Prices for wedding packages may change without notice.